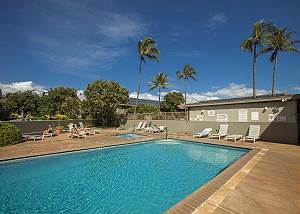 Kihei Bay Surf is an affordable vacation condo resort located in sun-drenched North Kihei. It is situated across from Kalepolepo Beach and near to the National Marine Humpback Whale Sanctuary. The longest stretch of beach on Maui is just steps from your condo rental accommodations. Imagine yourself waking up with a walk along the beautiful soft white sand beach and closing the day out on your condo's private lanai enjoying the breathtaking Hawaiian sunset. Let Hawaii happen and let Kihei Bay Surf be your rental of choice! 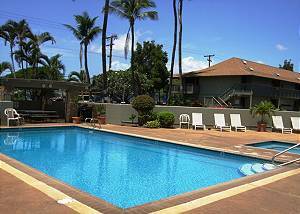 You'll find that the Kihei Bay Surf condo rentals are at affordable prices as well as in a great location! There are many shops nearby as well as activities vendors so you can make the most of your Hawaiian holiday. 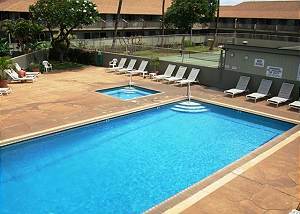 These Maui vacation rentals are also close to many different dining options as well as supermarkets. We are also conveniently located just 15 minutes from the airport. The beach park across the street, Kalepolepo Beach, is great for watching sunsets and relaxing under the sun. If you want to be active on holiday, this resort has the facilities and location for you. They have a tennis court for you to practice your swing, a pool for you to practice your stroke, the beach across the street for any water activities you would like. It's also just minutes away from a great beginner surf break at the cove at Kalama Park if surfing is on your agenda. Get the full Hawaiian Island experience at Kihei Bay Surf! Our apartment units for rent are each thoughtfully appointed and designed to meet your needs. Kihei Bay Surf wants you to have your best Hawaii vacation yet! So come join us for booking and accommodations that are 'a walk on the beach'. Whale watch at the sanctuary across the street, stroll with your sweetheart along the beach, barbecue with friends and family, and close the day out sipping a tropical drink on your private lanai on the beautiful isle of Maui. Book Kihei Bay Surf and let Maui happen!